Targa Tasmania has wrapped up its twenty seventh year and caps itself yet again as Australia’s premier tarmac rally series. It really is an event for any driver as there are ten distinct categories to choose from. There’s the Rookie Rallye, Vintage and Classic, Early Modern, and GT Sports Trophy, just to name a few. Combined with these categories is the ability to show up in approved cars that can date back to 1900. This year’s event was also round two of the CAMS 2018 Australian Targa Championship, with the first, Targa North West, also held in Tassie and is intended to give drivers a “taste” of the Targa Tasmania. The next events are Targa Great Barrier Reef before heading south to Victoria for Targa High Country. TT as some call Targa Tasmania, covers close to five hundred kilometers and is run across thirty-three special stages. 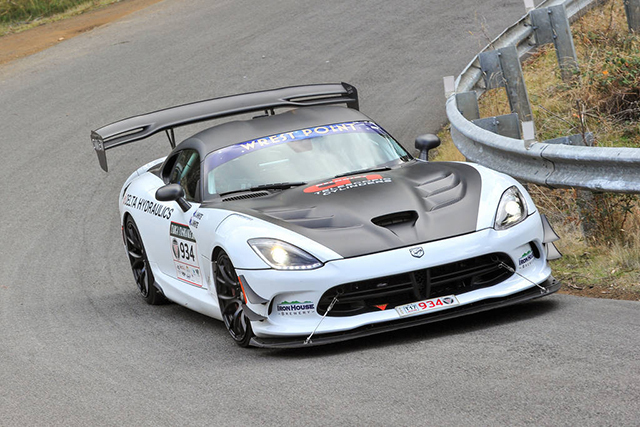 The overall winners were once again Jason and John White in their Dodge Viper ACR. Jason and John have raced in twenty-one Targas, and have also moved into second place of the all time overall winners, sitting behind former Australian Touring Car Championship driver Jim Richards and long time ally and former V8 Supercars commentator, Barry Oliver. Oliver had also announced his retirement from motorsport prior to the event. The win placed the duo first in the Wrest Point GT2 class (cars made from January 2008 and two wheel drive, minimum 500 made). Second outright was a Subaru WRX STi, co-driven by Steve Glenney and Andy Sarandis. This had them win outright the RDA Brakes GT4 class (as per GT2, but with four/all wheel drive) and now lead the modern car section of the CAMS Targa Championship. Local honours were taken by Hobart doctor Michael Pritchard and co-driver Gary Mourant. They placed third outright in a Porsche and claimed second in the GT2 class. Former GT Championship driver Paul Stokell folded his lanky body into a Lotus Exige, one of many that competed and finished this year’s event, with co-driver Erin Kelly. The Whites were concerned about their tyres as co-competitors Matt Close and Cameron Reeves had been pushing them very hard prior to the final six stages. Jason White said: “We were actually having a lot more sweat about what was going on with the tyres. It really forced John and I to be at the top of our game.” Relief came for the Whites in the form of Close and Reeves’ Porsche GT3 losing traction on cold tyres and going off-road, damaging the car enough to stop further competitive driving. The third round of the CAMS Australian Targa Championship is the inaugural Targa Great Barrier Reef to be held in Cairns from August 31 to September 2. Have you ever competed in Targa Tasmania? Or is it on your ‘bucket list’ to get down south and have a crack? Head over to the Rare Spares Facebook page and tell us all about it in the comments section below this article!